What is a Short Sale And is it Right for You? A short sale is a good option if you’re a homeowner who has mortgage debt beyond your means. You’ll have to meet specific criteria and get your lender to agree to the transaction, but at the end of the day, you’ll get to walk away from your home without a big hit to your credit. Whether you’ve taken out a second mortgage, refinanced, or your first mortgage is too high for you to handle, falling property values could get you in trouble. Some people consider giving the lender the keys to their home and walking away, but this could ruin your credit for years. Instead of giving your house back in foreclosure, consider selling your home via short sale. A short sale is when the homeowner either owes more on the house than the house is worth or is unable to sell the home because, after the fees and commissions associated with a sale, there won’t be enough left over to cover the mortgage balance. To initiate a short sale, the seller asks the lender to allow them to sell the home at its current market value and forgive the difference between the sale price and loan balance. If the lender thinks it will make more money off the short sale than in a foreclosure, the lender will approve the sale. 1) You can prove hardship. 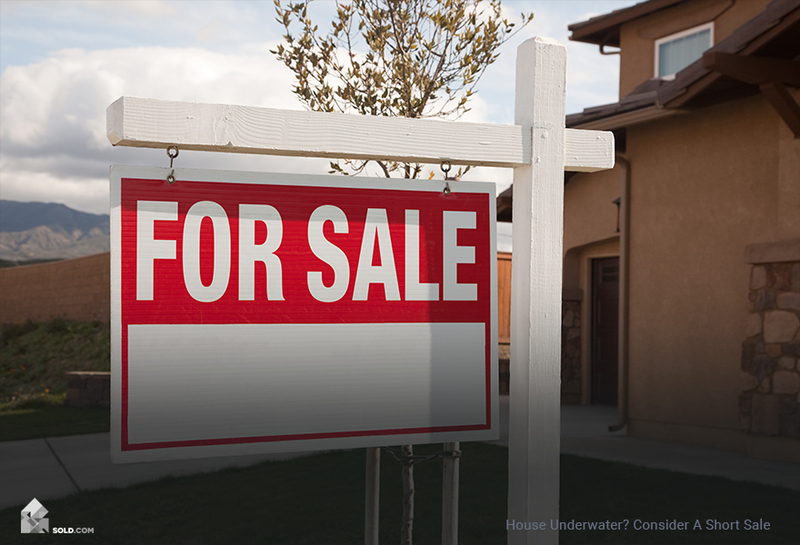 The simple fact that your home is underwater isn’t enough for a lender to agree to a short sale. If you continue to make your mortgage payments, at some point you will build equity in your home. So you’ll have to send a hardship letter to your lender that outlines the reasons you can’t continue to pay the monthly loan obligation. If you recently lost your job or have had to reduce your work hours, or if you have a disability or suffered an accident that prevents you from working, it’s easier to prove hardship than if you’re gainfully employed. 2) You don’t have other taxable assets. Before agreeing to take a loss on the loan, most lenders will ask that you sell your other assets in order to pay off the mortgage. 3) You can justify the low price. The lender will order one (and sometimes multiple) appraisals to ensure it’s not taking a loss for no reason. To improve your chances of the lender accepting the suggested purchase price, submit a comparative market analysis that shows the price is within market rates. Take our Home Seller Evaluation to find the best-personalized home selling options for you! 4) Your lender still owns the loan. Sometimes lenders will sell the loans they originate and the third parties which buy the loans do so with specific returns in mind. As such, they are less likely to approve a short sale. 5) You have a place to live once you move out. You won’t receive any money from the sale so you’ll need to have the resources to secure an apartment (i.e. deposit and first month’s rent) or have a friend or family member with whom you can live. Despite some information out there, you don’t have to have already missed a payment or be in foreclosure in order to get your lender to agree to a short sale. In fact, it’s better if you ask for a short sale before you get to that point, as missed payments and foreclosures could wreak havoc on your credit. The only drawback is that it will most likely affect your ability to get financing from the short-changed lender in the future. If you’re struggling to pay your monthly mortgage obligation and your home is worth less than the total outstanding loan, you’re probably a good candidate for a short sale. It’ll protect your credit if you think you’re in danger of missing a payment and can help you walk away from a bad investment. Just make sure you hire an agent who’s experienced with short sales to take care of the details and protect your interests. In “short” — yes. While far less damaging than a foreclosure, a short sale can have implications for your credit score. Lenders may report it for up to seven years as an account “not paid as agreed.” Additionally, if there were any delinquent payments preceding the short sale payoff these will appear on the report and impact your FICO score. Also, as with a foreclosure, any debt canceled by your mortgage lender due to a short sale may be taxable, depending on your loan terms (check with your lender if you are uncertain). In any case, your lender will report the debt cancellation to the IRS on a 1099-C form. These factors should be taken into account before you make a decision about a short sale.